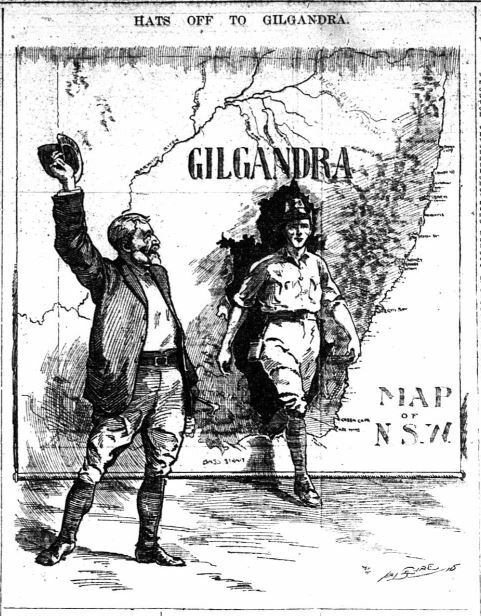 The ‘Hats off to Gilgandra’ cartoon drawn by Hal Eyre was first published in The Daily Telegraph on Saturday, 16th October, 1915. 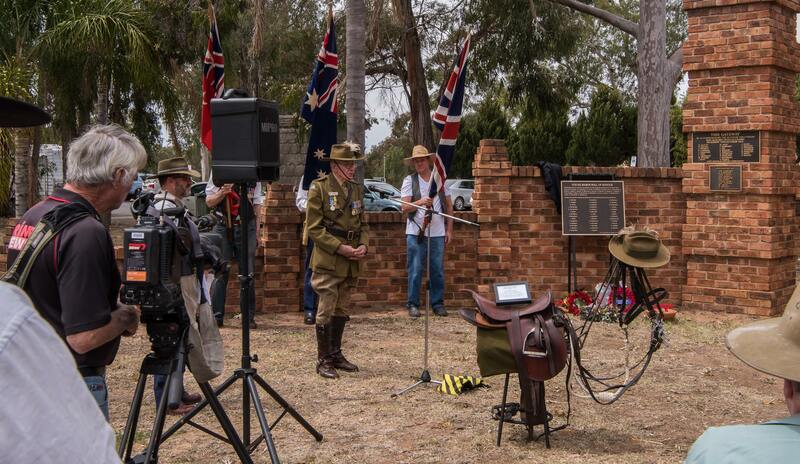 This was 6 days after the start of the Coo-ee March at Gilgandra. 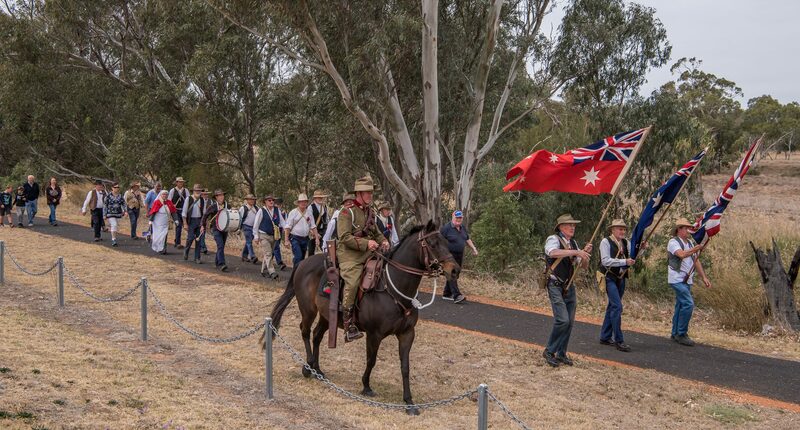 An article titled ‘Recruiting : an energetic campaign’ which reported on recruiting campaigns and new recruit numbers around the state of New South Wales, was also on the same page. 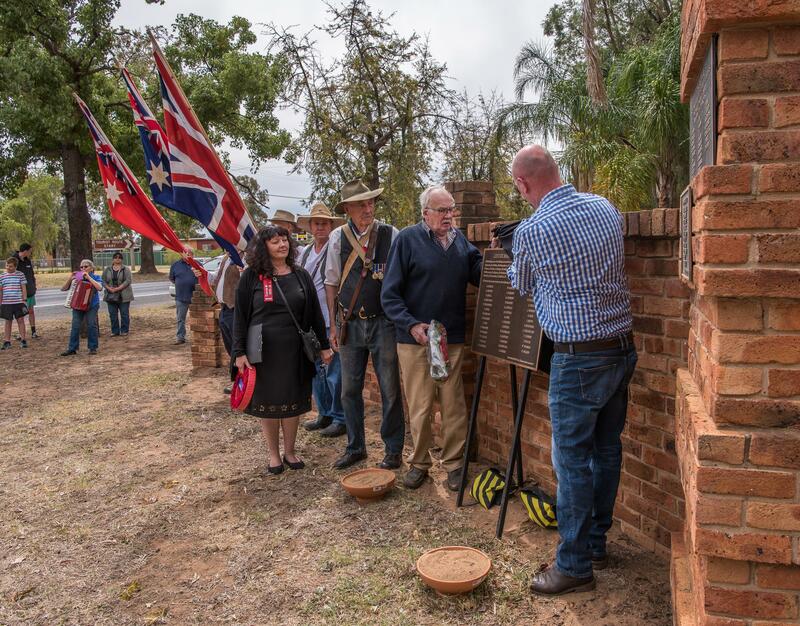 The Dubbo Dispatch and Wellington Independent later reported that ‘At the time of the Coo-ee’s march, Hal Eyre, of the Sydney “Daily Telegraph” struck the note and illustrated it’, and ‘That drawing made Hal Eyre and Gilgandra famous – it was reproduced in most of the leading journals of Great Britain and America’. 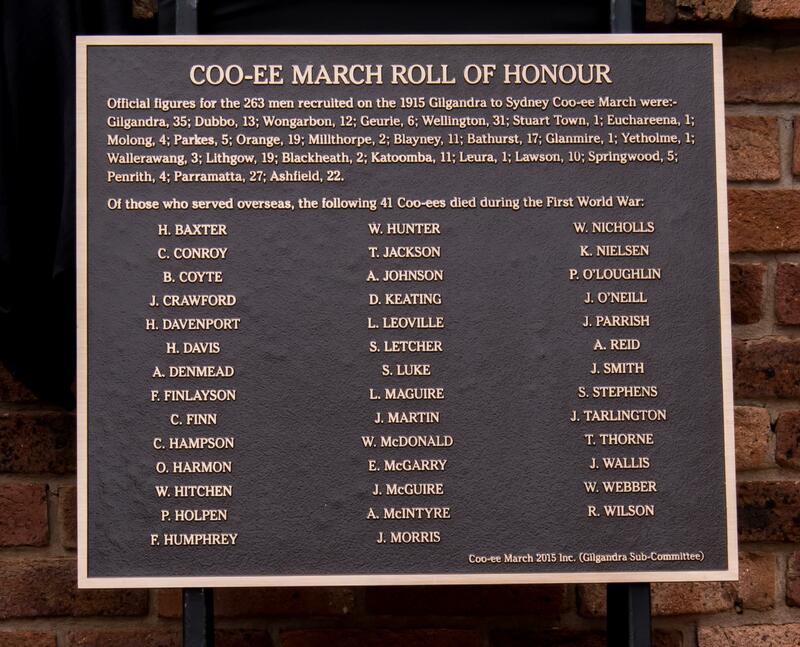 Hal Eyre drew 357 drawings for The Daily Telegraph during the First World War, and these were purchased by the State Library of New South Wales in 1920. 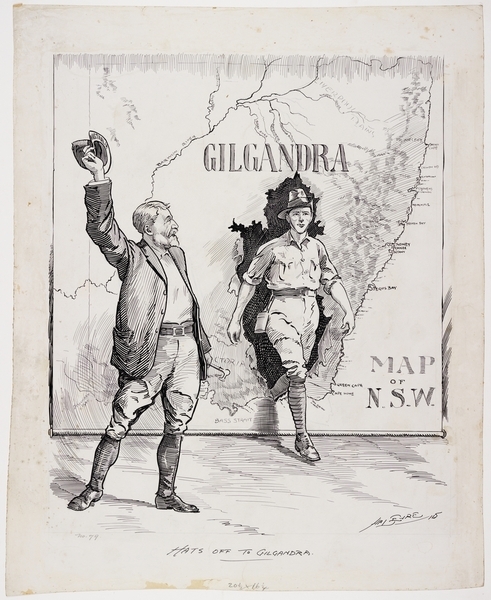 ‘Hats off to Gilgandra’, cartoon by Hal Eyre, in the Mitchell Library collection, State Library of New South Wales, Ref. no. a5773062. 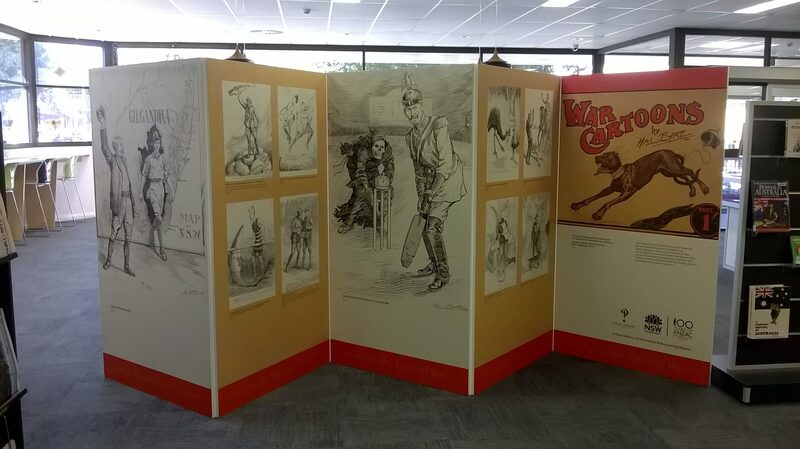 The State Library of New South Wales currently has a travelling exhibition Satire in the time of war : cartoons by Hal Eyre 1914-1918, which displays the ‘Hats off to Gilgandra’ cartoon, along with a selection of the cartoonist’s other drawings. The cartoons are reproduced on large display boards, which give viewers a great opportunity to study this cartoon up close. 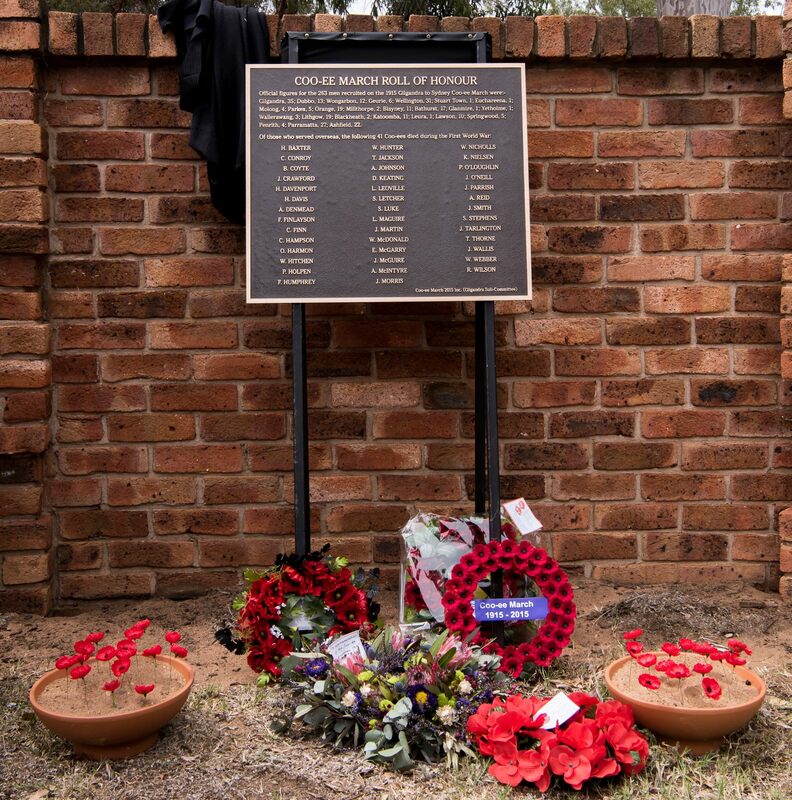 This exhibition, which is being displayed in public libraries around New South Wales, was launched on 1st October 2016 at Glenn Innes, and was displayed at Gilgandra Public Library from 12th to 24 November 2016. 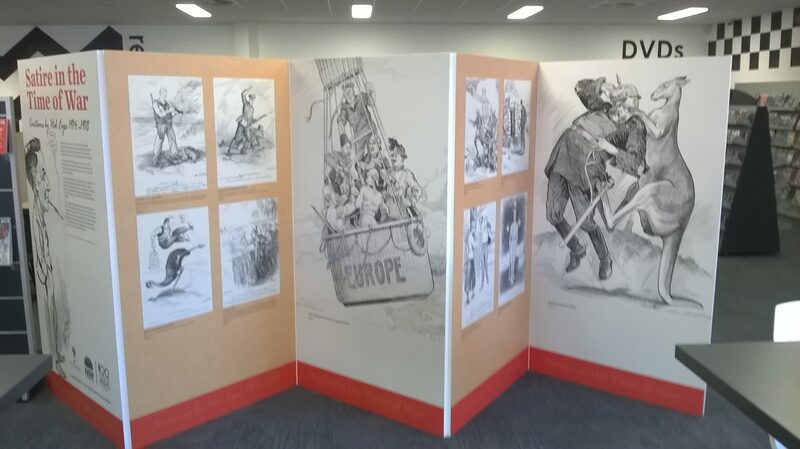 It is currently on display at Dubbo Branch of Macquarie Regional Library until 15th December 2016, then will be at Katoomba from 23rd December 2016 to 12th January 2017. 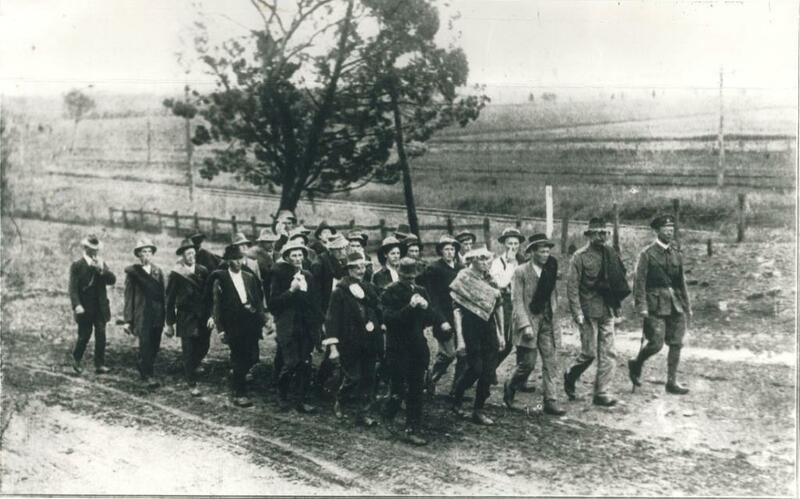 ‘Hats off to Gilgandra’, The Daily Telegraph, 16 October 1915, p. 10.